When you wake up in the morning and look outside only to see that a new blanket of snow was left behind overnight, it can be hard to try to motivate yourself to get up out of your warm blankets to head outside for your workout. That said, just because it’s cold outside, it doesn’t mean that you can skip your exercises. Otherwise, you’d be staying in bed and hibernating for four months out of every year. The next time you find yourself daydreaming about staying at a Mexico beach house instead of a trek out into the frosty weather, consider using some of these great ways to stay motivated throughout the winter. • Embrace it – “When you can’t beat em, join em,” says the old saying. Since you can’t change the weather and it’s not going away, it’s time to head out and make the best of it. 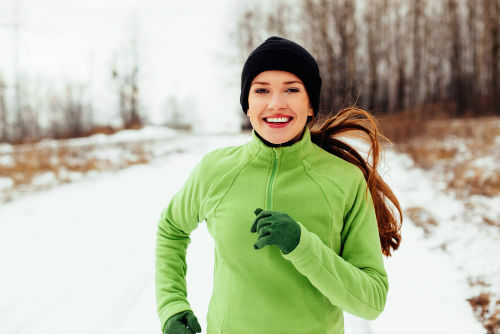 After all, there are tons of great ways to get a workout when there’s a ton of snow on the ground and more than a bit of chill in the air. Consider getting into snowshoeing, downhill skiing, cross country skiing, skating, or just head out all bundled up for a great jog. Being outside in the winter is just as good for you as it is in the summer and it will help you to beat the winter blues while you’re at it. Let the cold air motivate you to get moving to warm up! • Buy the right winter gear – Few things will motivate you to exercise more than the chance to buy new gear and try it out. Make sure you have all the right clothes to wear to stay warm and dry, as well as the proper equipment for the sport you plan to play. That said, make sure you’re buying things you’ll actually need and not just spending where it isn’t required. Focus on quality products. You’ll find that they will keep you warmer and will last longer. In the winter, the cheapest options are rarely the best ones, but you can still find some great deals to make your workouts affordable. • Buddy up – Training with a buddy throughout the winter can make it easy to feel great about heading out even when the temperature has plummeted and the snow is falling. Find someone as motivated to reach their goals as you are to reach your own. That way, you will only drive each other to show up and do better each time instead of losing energy trying to convince your buddy that it is worth it to head out each day.